The 90th edition of Spengler Cup, held in Davos from 26 to 31 December 2016, has its participants announced: beside title holder Team Canada and host HC Davos, two teams from KHL will battle in Davos: Dinamo Minsk, returning after the victorious campaign of 2009 and Avtomobilist Yekaterinburg, partecipating also in last edition. Another returning team, after the final lost in 2015, is Swiss vice champion HC Lugano. Finally Mountfield HK from Czech town of Hradec Kralové will debut in the most famous tournament in the world. Tony Hand and Steve Moria’s induction into the British Ice Hockey Hall of Fame is deserved recognition for two excellent servants of the game in this country. As the first British player to be drafted in the NHL, Hand had an opportunity to make it at the very highest level but chose to come home. We’ll never know whether Hand could have been a success in the USA, but his decision to return to these shores was certainly beneficial to the British game. During his 33-year domestic playing career Hand was a popular figure with fans across the country, while he also enjoyed nearly 20 years on the international stage with Great Britain. He has spent the last nine seasons with Manchester Phoenix and recently agreed a new two-year deal with the EPL club as their Head Coach, despite the club’s well-documented off-ice troubles. Moria first arrived in Britain back in 1987 and went on to enjoy a 25-year love affair with the British game. He is perhaps best remembered for his time with Cardiff Devils, helping them win the inaugural Superleague title, followed by the play-off crown a year later. Moria also represented Great Britain, winning 49 caps and topping the scoring charts during the 2000 World Championship campaign. During the latter part of his career Moria spent the majority of his time as Player/Coach with Basingstoke Bison and Slough Jets. He won the play-off title with the Jets in 2008 and successfully steadied the ship at Basingstoke after the club dropped into the EPL. The duo topped nominations made by Ice Hockey Journalists UK (IHJUK) members over the past three years. IHJUK and Hall of Fame Chairman Mike Appleton said: “The induction of both Tony and Steve is thoroughly deserved. “They are without doubt two of the most worthy inductees we’ve had in recent seasons, with their contributions to our sport second to none. “Presentations will take place in Manchester and Cardiff next season to celebrate Tony and Steve’s induction. They will be special and memorable occasions. There is a classic 1979 Soviet comedy called Moscow Does Not Believe in Tears, and that phrase fit the bill here. This wasn’t the dream ending the Russians had hoped for – let an atonement for bowing out in the 2014 Olympic quarter-final in Sochi – but at least they had some reasons to smile in their last IIHF Ice Hockey World Championship game in the Russian capital.”Even though we didn’t make the final, we wanted to give our fans something to cheer, to thank them for coming and supporting us throughout the tournament,” said Russia’s Roman Lyubimov. 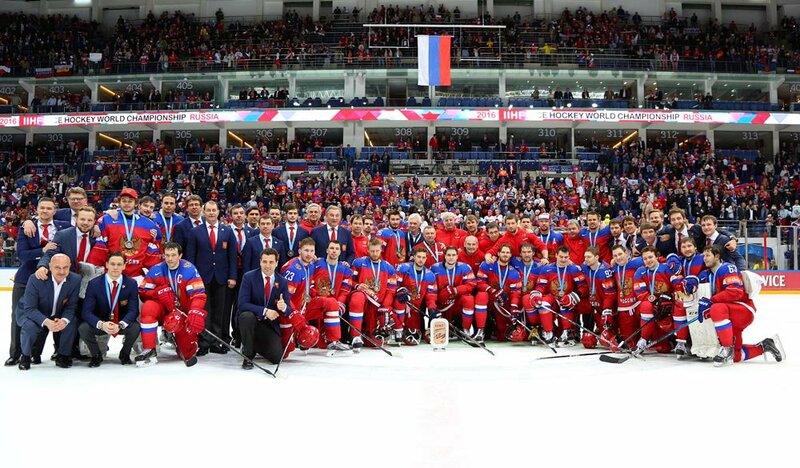 Under head coach Oleg Znarok, the Russians have now won medals at three consecutive Worlds: gold (2014), silver (2015), and bronze (2016). They’ve medalled at eight out of the last 10 Worlds altogether. Russia has also finished in the top three each time this tournament has hit Moscow, including 1957 (silver), 1973 (gold), 1979 (gold), 1986 (gold), and 2007 (bronze). Still, overall, the U.S. can take pride in salvaging a fourth-place finish. Coach John Hynes’ team exceeded expectations by making it this far after losses to Canada, Finland, Germany and Slovakia in group play. In the near future, the Americans could well find themselves in the final, thanks to USA Hockey’s excellent development programs. At 6:23, Voinov opened the scoring on a centre point drive through a kneeling Keith Kinkaid’s legs, with Sergei Shirokov providing traffic in front. That ignited Russia’s confidence. The mood lightened perceptibly in the Ice Palace with chants of “Shaibu!” from the partisan crowd of 12,043. The Russian power play struck to make it 2-0 at 13:41. Datsyuk sent a nice cross-ice pass to Mozyakin, who teed up a slapper from the left faceoff circle that beat Kinkaid high to the stick side. Mozyakin, 35, won the KHL scoring title this season (67 points) and captained Metallurg Magnitogorsk to the Gagarin Cup as the leading playoff scorer (25 points). He is the second all-time leading goal-scorer in Russian league history behind Boris Mikhailov. The U.S. had a rough end to the first period, as Russia’s defencemen began throwing their weight around. Dmitri Orlov caught Jordan Schroeder with a low hit, sending him cartwheeling and shaking him up. Then Maxim Chudinov rammed into J.T. Compher in front of the U.S. bench, appearing to leave his feet in the process. However, the check only garnered an interference minor. Russia’s antics continued at the start of the second period, as Telegin cut to the net off left wing and ran over Kinkaid. Not long afterwards, the U.S. had a good shorthanded chance, but Bobrovski stood firm to deny Brady Skjei on a rebound off the rush. Russia went up 3-0 at the halfway mark. Mozyakin found Datsyuk in the right faceoff circle with a hard pass, which the captain settled down before setting Telegin up for an easy goal into the wide-open net. The top-scoring Russian line combined for a beauty to put the game out of reach at 12:49. Vadim Shipachyov sent a clever cross-ice pass to Panarin, setting up a 2-on-1, and the Calder Trophy candidate with the Chicago Blackhawks pulled up before dishing it to Dadonov to bang into the open side. The U.S. broke Bobrovski’s shutout bid at 14:29 on Vatrano’s power play goal with Patrick Maroon screening in front. However, the Russians answered less than a minute later. Panarin went to the net and converted the rebound from Chudinov’s high shot off the post to make it 5-1. Mike Condon replaced Kinkaid in the U.S. net to start the third period, but it was too late to make any difference. Vatrano fired a one-timer past Bobrovski at 3:42 for his third goal of the tournament. But a full-fledged U.S. comeback was about as likely as cherry blossoms in December in Yakutsk, Russia’s coldest city. On only one occasion have the Russians failed to medal as the home team. They disastrously finished 11th at the 2000 IIHF World Championship, the first time St. Petersburg hosted the tournament. Connor McDavid’s first goal of the world hockey championship proved to be golden. McDavid’s goal in the first period stood as the winner as Canada successfully defended its world championship title with a 2-0 win over Finland in the tournament final. The 19-year-old Edmonton Oilers centre had registered eight assists in the first nine games of the tournament, but was one of just two Canadian forwards not to have recorded a goal coming into the gold-medal game. Max Talbot made 16 saves for his tournament-leading fourth shutout. Canada came ready to play on Sunday, registering the first seven shots of the game before the Finns fought back with several good chances late in the first period. Talbot, determined to bounce back from a sub-par personal performance in a 4-0 loss to Finland in the preliminary round, made big saves on Patrik Laine, Jussi Jokinen and Jarmo Koskiranta to help send the Canadians into their dressing room with a one-goal lead at the end of 20 minutes. In a hard-hitting second period, Canada outshot the Finns by a margin of 13-4. The best Finnish chances came with Mark Scheifele serving a slashing penalty late in the period, when Talbot stopped Koskiranta on the doorstep, then denied Laine as he shot the puck while streaking down the right wing. In the third, Canada took a page from the playbook of the Finns, who had allowed just eight goals in nine games heading into the final. Canada shut down the opposition with strong defensive play, limiting quality Finnish scoring chances. Koskinen made 31 saves for the Finns. Finland came into the final undefeated with a 9-0 record and had a chance to become the first nation ever to win the world under-18 championship, world junior championship and world championship in the same year, but fell one game short. Canada is the first repeat gold medallist at the world championship since Russia won back-to-back titles in 2008 and 2009. Canada’s last back-to-back wins came in 2003 and 2004. With his new gold medal around his neck, Canadian captain Corey Perry became the 27th player to join the esteemed Triple Gold Club, adding a world championship gold medal to his two Olympic golds from 2010 and 2014 and his 2007 Stanley Cup. Perry also won gold at the 2005 world junior championship. Perry joined an elite group of Canadian hockey players including Sidney Crosby, Patrice Bergeron, Jonathan Toews, Chris Pronger, Scott Niedermayer, Brendan Shanahan, Joe Sakic and Rob Blake. Panarin said Russia had played with more freedom after a weight of expectation was lifted following its semifinal defeat to Finland on Saturday. The 2016 IIHF Annual Congress assigned the tournaments of the 2017 IIHF Ice Hockey World Championship program. In Cologne, Germany & Paris, France, 5-21 May 2017 Participants: 14 teams from the 2016 IIHF Ice Hockey World Championship (including the two co-hosts) and the two promoted teams, Slovenia & Italy. The International Ice Hockey Federation grows to 77 countries after Indonesia, Nepal and the Philippines have been admitted as new associate members. Ice hockey has been played in Indonesia, the largest island country of Southeast Asia with over 13,000 islands, since 1996 and been organized by the Federasi Hoki Es Indonesia for several years. Indonesia is the world’s fourth-most populous country with 258 million people, more than half of them living on the island of Java. That’s where the country’s three ice rinks are located. There are currently five senior clubs and three youth hockey clubs teams involving 112 players. The Sky Rink on the third level of the Mall Taman Anggrek in Jakarta Barat was opened in 1996 and has an ice sheet of 1,248 square metres. In recent years two more rinks opened with Gardenice (800 square metres) in Bandung and the 24-on-55-metre BX Rink at the Bintaro Jaya Xchange Mall in Tangsel in the Jakarta region that has become the country’s premier ice sport facility. Nepal is a landlocked country with over 31 million inhabitants in the Himalayas area with China bordering in the north and India in the south. With an ideal climate for ice hockey, the country wants to start organizing the sport in the country. Currently there are no ice rinks but four outdoor inline hockey rinks in the capital of Kathmandu, Pokara, Ilam and Kavree. The association was founded in 2014. Nepal Ice Hockey Association President Lok Bahadur Shahi handed over a symbolic present to IIHF President Rene Fasel in form of a Khukuri knife, a symbol of Nepalese independence. “With the support of the government and the IIHF, we are looking to build a new chapter in Nepalese sports with ice hockey,” he gold IIHF.com recently during a visit at the IIHF headquarters in Zurich and hopes that the first ice rink can soon be built in the capital Kathmandu – the land has already been acquired. Currently ice hockey can only be played on natural ice during winter months. Like Indonesia, the Philippines are an island country in Southeast Asia consisting of over 7,000 islands and with a population of 100 million people. 211 players from five clubs are registered in the Philippines where four ice rinks can be used, the main one being the SM Mall of Asia Ice Skating Rink in Pasay City next to the capital of Manila. The other ice rinks are at Megamall, Southmall and the Seaside Cebu Ice Skating Rink. Click on the video link on the right to watch a presentation of ice hockey in the Philippines. In 2017 the Southeast Asian Games are set to have an ice hockey tournament for the first time ever. The event that has taken place biannually since 1959 will take place in Malaysia and with Indonesia and the Philippines joining previous Southeast Asian IIHF members Malaysia, Singapore and Thailand, all these countries could potentially enter a team. In addition to accepting three new members, the Qatar Ice Hockey Federation – until now an associate member – has been awarded full membership.